Okra - we grill it! We cook them whole. You can trim the tops a bit, but don't cut them off completely (keep the pod sealed) Gary likes the tops, me, not so much. Just a little olive oil - enough to keep them from drying out & for the salt and pepper to stick, but too much makes them softer than I prefer. Best eaten right away unless you want to cut up leftovers for soup. Planting Dates: Plant seed in the spring after all danger of frost. The best time is when the soil is between 75-90°. In general, April 1 - June 15. Planting Method: Soaking the seed in water for 24 hours before planting speeds germination. Adding a couple tablespoons of seaweed and/or vinegar works even better. Sow seeds at 4-5 per foot of row and ½-¾ inch deep. Seed Emergence: 4-14 days in warm soil, 70-95°. Mine usually germinates from 12-14 days. Harvest Time: Harvest the young pods daily. Pods should be about 3-5 inches long. Once they get large and tough, they are no longer edible. They can usually be harvested 50-70 days after planting, 4-6 days after the first flower blooms. Final Spacing: Thin seedlings to 6-9 inches, rows 3-4 feet apart. Some gardeners like to thin out farther to 12-18 inches. Growth Habits: Upright growth that’s aggressive after the soil has warmed in the spring. 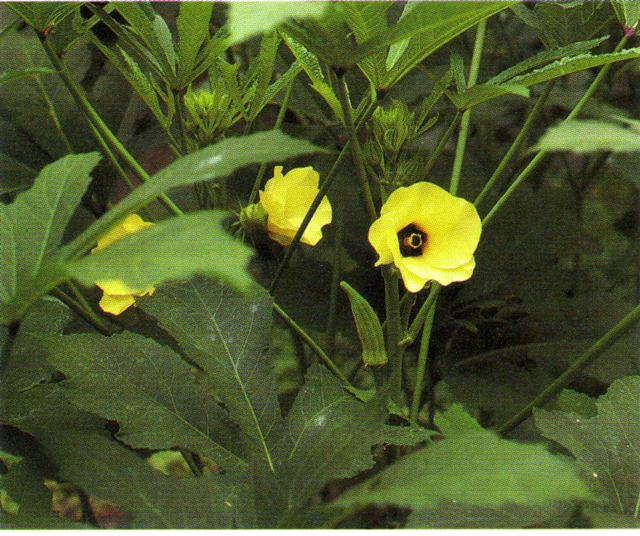 Large leaves, edible yellow flowers, and spiny stems. Culture: Okra enjoys hot weather and is easy to grow (if you control the root knot nematodes with citrus) in healthy, well-drained soil. Okra does like to be fertilized a couple of times with organic fertilizer, but does not require large amounts of water. Lava sand and soft rock phosphate will help to increase yields. Also, Texas Greensand should be used in alkaline or high-calcium soils. Maintain a thick mulch layer around plants after they start to grow. Fertilize when the plant blossoms in the spring. If you have a long harvest of okra, fertilize again about a month later. Use a handful of compost and organic fertilizer per plant or 3 cups per 25 feet of row. 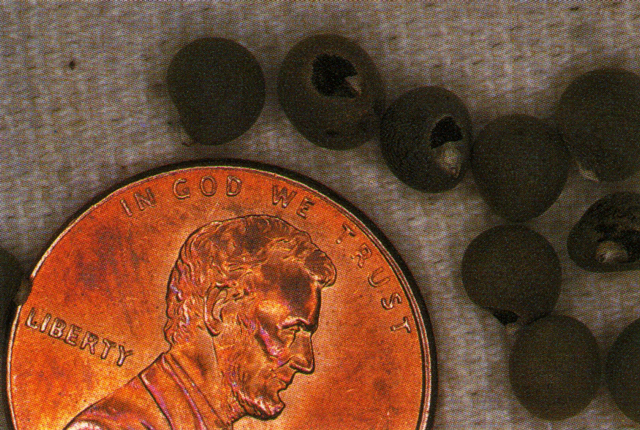 Troubles and Solutions: Curled or crooked pods are usually caused by insects like stink bugs. Control with citrus sprays. Will not germinate in cool soil. Don’t get in a hurry. “Wet feet” can be avoided by planting in healthy well-drained soil. Aphids are controlled with molasses-water spray followed by the release of lady beetles. Fire ants are controlled with citrus sprays. Nematodes are controlled by tilling orange, grapefruit, and other citrus pulp into the soil before planting the seed. Control cutworms with D-E around seedlings. Fungal diseases can be controlled with Garrett Juice, garlic tea, and potassium bicarbonate. Cotton root rot can be controlled with biological products such as Actinovate and Plant Health Care. Okra needs full sun all day. Even cloudy days cut production. Harvest and Storage: Okra provides a long harvest season. Pick the young pods when they are young and tender. Store if necessary in the refrigerator but be sure to eat the pods fresh. Expect about 20-30 pods per plant. Harvest daily or at least every other day. Leaving pods on the plant to mature shuts down new pod formation. Watch out for the spines. Notes: Okra can be cut back in midsummer to create more bushy plants. Fertilize with organic fertilizer immediately after cutting back. Okra can be grown in dry land or without irrigation in some years. Okra seed is about the easiest to save. Just let the pod completely dry on the stalk, then cut it off with pruning shears. Store it someplace out of the weather. Mice, weevils, and other critters ignore it, and it keeps almost forever. Mixing okra seeds with other seeds while in storage seems to repel weevils and other pests. Varieties: Emerald, Burgundy, Clemson Spineless, Louisiana Green Velvet, Annie Oakley, Red Velvet, and Beck’s Big.